April Kennedy...My Life + My Style: IT'S GIVEAWAY TIME! This sweet little tweet-tweet ring dish from Anthropologie is up for grabs and is no longer available in store or online! I happened upon it during an incredible sale and picked up two. One for me and one for you! Don't be shy. I know people are reading that have never introduced themselves. Now's your chance. I really would love to hear from you. Leave a comment here for one entry and if you are feeling a little selfless and want to share the details of the giveaway on your blog with a link, come back and leave another comment letting me know that you spread the tweety love and you will earn yourself another entry! Winner will be announced on Wednesday! Good luck. P.S. Apron sneak peak at Funky Vintage Kitchen and Guest Blogger over at Butterflies! I love that I'm the first to comment: ) Yea for birdies! April, that ring bowl is just SO lovely!! I'd love to win! Please count me in twice... I've posted about the giveaway on my blog. YAY! 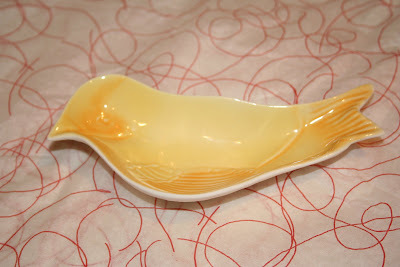 i love that little dish- i just wrote a post about it :) how sweet of you! What a cute dish! Love birdies! What a beautiful little lovely! I'll be back...I'm going to post about your giveaway for an extra entry. Thanks for the opportunity to win! If I win I would give it to my best buddy Kathy - she loves birdies and Anthropologie! Thanks! I think mom's should count twice. And look at all the people than come to your blog just to read MY comments! Besides I LOVE yellow and this is the first thing you've given away that I actually want! Thanks for taking care of your brother today. You're a wonderful big sister. This is my first time entering a GIVEAWAY! I'm so proud of me! Thanks for the chance to win. Yellow is my new favorite color. I got yellow sneaks for this summer. Pick me! So adorable! I'm here by way of Mine, by Magpie...and would love that birdie! I'd love to win it, it's very cute! I need to go to Anthropologie soon! So stinking cute April!!! I have never shopped at Anthropologie, no idea what they offered, always assumed it was clothes....who knew? Off to post on my blog! That's very cute and I'd love to have it or possibly give it away! I just did an Antro giveaway. I would love to have a little flyback. So tweet. I love the color and shape. I am buttoning you up. I LOVE Anthropologie, I'm lovin' yellow, & birdies are sweet too! Please enter me! There's just too many people who want this birdie. How will I ever win??? my grandmother collects little dishes she would love that. i will have to keep my eye open. How CUTE is that?! Gotta love Anthro for keeping us stocked with little retro treasures! Hi! I'm a friend of Tracy's (Diary of Sweet Nothing) and have heard her low about your blog so I thought I would stop by for a read! Take care! Count me in, if I win, you can give give it to your Mom because Mom's deserve to win sometimes!